Although you can easily buy a jar of “vodka sauce,” it’s so easy to make that it’s silly not to. But the vodka and cream add up and after weeks of indulging I’m trying to lighten up my dishes a bit for the warmer weather. So I’ve replaced the calorie-laden heavy cream with nonfat Greek yogurt – is there anything that magical ingredient can’t make better? There’s still a splash of vodka and plenty of Parmesan cheese, so I’m not going to go so far as to say this dish is healthy, but it’s a step in the right direction. Whole wheat pasta might help your case. Subbing heavy cream for fat free Greek yogurt helps to lighten up this delicious pasta dish without sacrificing flavor or creaminess. Heat the olive oil in a large skillet over medium heat. Add the onions and garlic and saute, 5 minutes. Add the crushed tomatoes, vodka, and red pepper flakes, if using. Simmer, uncovered, until reduced by half. Stir in the yogurt and parmesan cheese. To make it extra smooth, blend it with an immersion blender here (optional). Season with salt and pepper. Add the penne and toss to coat. Remove from the heat and serve immediately, with additional parmesan. A friend recently introduced me to this dish, but I’ve held off on making it due to the health factor. I think the substitution of the Greek yogurt is genius! 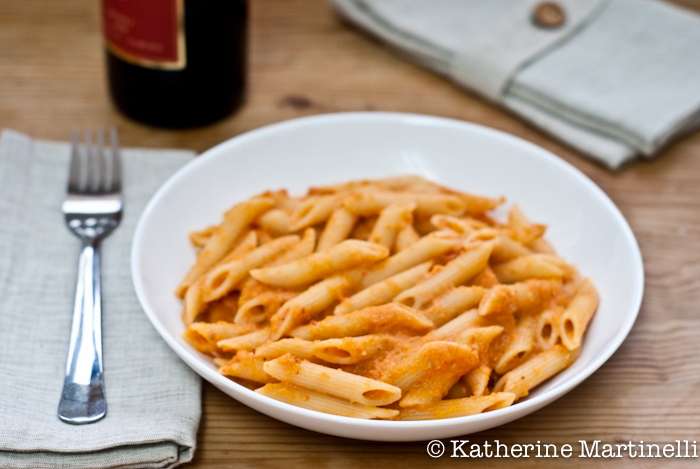 i love vodka sauce, and now i need to try your version with the yogurt! great idea! Welcome back 🙂 I think yogurt is magical as well. Add to anything I want to lighten up and use instead of mayo&cream. I have not been traveling in the blogsphere a lot as well and I am glad to be catching up with you ! I love penne a la vodka. It’s not something I had heard of here in Australia, but came across it a few years ago in a cookbook and was so glad I did. I love your healthy spin on this with yoghurt. What a great idea. Okay, I nominate you for sainthood. Skinny vodka sauce? Yes please! Penne a la Vodka is my go-to pasta dish in restaurants but I avoid indulging at home. A lighter version sounds like the perfect way to go! Great idea girl! Love the idea of a skinny vodka sauce! How genius is this! We all know that the standard plating of this does ring up the calories and fat count. The substitution of the yogurt does inspire me to think of subbing it in other dishes. I just commented on another blog I need to start experimenting with different dairy products and bingo, you are ahead of me! Well done Katherine! Yogurt! Omg that is genius. I can’t wait to try this. My entire family loves pasta with vodka sauce. I have never heard of this dish. But yes the addition of vodka and yogurt is a great idea. You know that I never made pasta alla vodka? I will have to try it! It looks delicious! I love your story about the drag queens, haha I could just imagine it. How fun! Vodka sauce is my fav! and right before summer I could use a lighter version – will be making this. Love taking a super indulgent dish like this and making it skinny. The Laughing Cow Cheeses are also great for adding that rich creaminess. This dish looks amazing and welcome back! I love anything with a Vodka sauce. This looks amazing and needs to be made in our house asap! This is comfort food at its best! Looks absolutely fantastic K! Oh, I love that you’ve made a skinny version of one of our family favorites!!! So yummy! This looks fantastic – I am very excited about the skinny version of this sauce! I can’t wait to try this – I’m such a penne fanatic! Thanks for this post! Welcome back! And you’ve chosen an excellent recipe for your return – one of my fav’s too. Greek yogurt rocks, doesn’t it? And I could eat past every day of the week. Good post – thanks. I have been meaning to make penne alla vodka for many years! Looking at your gorgeous lightened version I still wonder why I have waited so long… Thanks for this wonderful recipe. I never thought about making this dish with Greek yogurt.. good idea! I like penne with vodka sauce. This looks delectable. I love penne a la vodka and using Greek yogurt instead of cream in recipes! You’re right, it’s hard to think of something greek yogurt can’t bring some awesome to. Can’t wait to make this! Penne a la Vodka is one of my absolute favorites. Love that you swapped the cream for Greek yogurt, and I agree with you – it’s truly a magical ingredient! This is one of our favorite pasta dishes. Your use of Greek yogurt is inspired! I hope you had a lovely time on your travels and with your sister. I think so I had seen this dish somewhere in europe before, but I am not sure. Looks and sounds like a easy quick to prepare pasta dish, perfect when I am too lazy to cook something big. thanks for sharing your recipe Katherine! I’m an Italian (Abruzzese) living in Ontario Canada. We love vodka sauce but we never use cream. We just add some diced pancetta in with the onion and some torn fresh basil before serving. Either way it’s wonderful – the vodka brings out all the flavors. Thank you, you have a wonderful site. Ooh I will have to try it like that some time, it sounds wonderful! Thanks so much Mark. Leave it to us Americans to try to add cream to everything. You just gave me such a great flashback! I’m writing a blog about Stingy Lulu’s which is how I found this post. I used to get the penne too. Whoops! Just one blog post, not a whole blog. Haha still looking forward to it! What is the Nutritional Information for this dish??? I’m afraid I’m not a nutritionist so I don’t know and don’t want to provide information that I’m not sure about. Sorry about that. I made this recipe for my boyfriend and I tonight and it was delicious! I always try making healthier versions of not so healthy dishes. Thanks! I’m so happy to hear that you enjoyed it!!! I also love making healthier versions of my favorite dishes. What kind of Greek yogurt? Vanilla? plain? Shopping for a used or new automobile could be a tough approach unless you know what you are actually performing. By educating yourself about car buying prior to deciding to head to the dealer, you possibly can make stuff much easier for your self. The following tips will help your upcoming buying getaway be more pleasant. Generally take a auto technician coupled when looking for a brand new motor vehicle. Vehicle dealers are popular for selling lemons and you may not desire to be their up coming sufferer. Provided you can not get yourself a mechanic to look at vehicles along, at least ensure that you have him evaluate your ultimate decision before you purchase it. Know your restrictions. Before you begin buying for your car or pickup truck, determine how much you can afford to shell out, and follow it. Don’t forget to add desire for your calculations. You can expect to pay about 20 percent as a down payment as well, so prepare yourself. Well before attending a car dealership, know what sort of car you want. Analysis most of you choices before buying in order to figure out what works well with your finances and family members demands. Do your research to determine exactly how much you must pay for any possible automobile. Prior to signing any commitment take the time to read through each collection, including the small print. When there is nearly anything detailed you do not fully grasp, do not indication before you have an answer which you fully grasp. Unsavory salesmen are able to use a contract to place several service fees that had been not reviewed. If you keep your preceding suggestions in mind next time that you just go purchasing a vehicle, you will be more prone to get a better deal. Getting a auto does not have as a headaches. Simply use the information with this post and you will get the car you need with a excellent price. I just made this and it delicious!!! I’m a novice when it comes to vodka sauce so I’ve only tried a few bites of friends’ dishes while out. But I wanted to try my hand at making it and didn’t want all the calories. I followed the recipe to a T. It was so good and I can’t wait for leftovers tomorrow!